For whatever reason, I have been thinking of loaded fries lately. Not sure if I had nachos on my mind, or maybe it was those darn kimchi fries I made not too long ago, but it was time for me to take some action and get down to it and make a batch of fries. I had set out a rump roast the previous evening and not knowing what to do with it, I decided to turn it into some Mexican fajita meat, and beat down my craving for fries. This is when the whole idea of fajita french fries came into play. 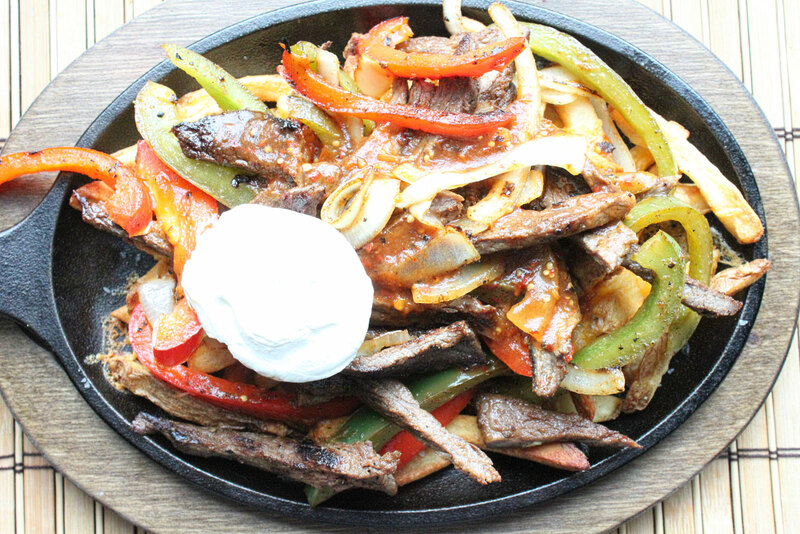 Think of this as everything you love about fajitas, but stacked on top of crispy cheese fries. Addicting, delicious, and something perfect for snacking on with some friends. Typically flank or skirt steak are used for fajitas, but the rump roast turned out just fine, especially in a great marinade. Start by marinading your meat. Mix the brown sugar, half of the lime juice, garlic, and soy sauce in a baking dish, and mix until the sugar dissolves. Add in your rump roast, and gently toss to combine the marinade. Cover and let this marinate for at least 3 hours, preferably overnight. To another bowl, add the peppers and onion, and toss in the other half of the lime juice, black pepper, garlic powder, salt, and cumin powder. Give a good stir, and cover and place in the refrigerator. When you are about ready to make these fries, heat a large cast iron skillet on medium-high heat. Once heated, add in the oil and give it a nice swirl. Lay in your meat, being careful not to crowd it, and cook on both sides until it is nice and caramelized. You may have to wash out and scrape your skillet and repeat as the sugar from the marinade may stick to the skillet. Repeat with any remaining beef. During this time, cook your french fries until they are nice and crispy. Once the meat is cooked, cut into thinner strips. To another skillet, add in about a half tablespoon of oil, and on medium-high heat, add in the bell peppers and onions. Cook until they are just slightly softened. Remove the fries when they are crisp and top with the shredded cheese. Return back to the oven until the cheese is nice and melted. Remove the cheesy fries, and top with the sliced beef and bell peppers and onions. Drizzle on your salsa and give a little dollop of sour cream. Now get in there and dig in. Talk about comfort food! The crispy cheesy fries paired with the peppers and beef. Whoa. Don’t even get me started on the beef. My kids saw the beef right away and wanted me to make them some Mexican street tacos (which I did) and I thought they were going to eat it all, preventing me from making my fries! Hands down a fun dish to serve up. 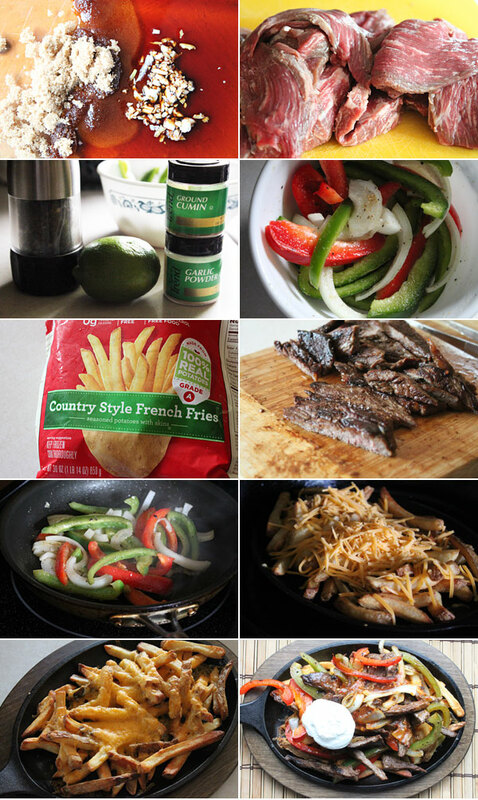 Fajitas in french fry style. What’s not to love. Hope you enjoy!